In the course of playing music I had met a local band manager and promoter Dave Leaper. Dave and his partner (Mal Spence) ran a management company and music shop "Supermusic" in York. Supermusic was the place to hang out for most of the musicians around town. There was always coffee on the go and a very friendly atmosphere, I was always hanging out there when not working. 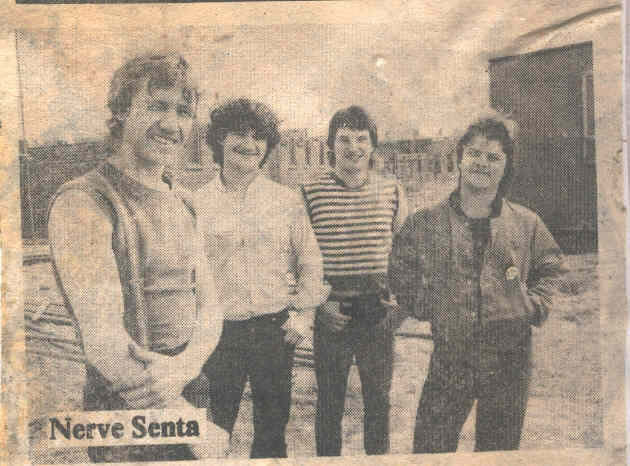 Nerve Senta were looking for a keyboard player and Dave had recommended me to Garry Barrett the lead singer. Nerve Senta were York's biggest band at the time with a massive following locally, so I went down to one of their outside summer gigs at the Beagle pub in Acomb. I was amazed at the amount of people at this concert, there was hundreds of fans everywhere it was impossible to get inside to the bar for a drink. As the band came off stage at the end of the first set, I managed to introduced myself to Garry and arrange for me to attend an audition with the band the following week. I stayed to watch the rest of the concert and was very impressed at how good they were - I was really pleased, I wanting to be in this band. The Audition: My Nerve Senta audition was held at a village church hall in New Earswick just outside of York and although a nerve wrecking experience the guys in the band made me feel at ease. I was showed a couple of songs that we practiced a few times and I was told I was in - it was that easy (or so it seemed). I was told by the band that we were going into a recording studio to record an album and then we would start a small local tour because there was a lot of management and record company interest in the group.I felt like I'd made the big time and won the pools. I was sure it was all going to happen overnight. We had a month of rehearsals before going into Fairview recording studio in Hull. Studio time was expensive, so we would only have 2 days to record 8 tracks with the previously recorded and released singles 'letter to Jodie', 'Secret Admirer' and B sides making up the rest of the album. The recording of the album was two very long hard days but great fun, we just laughed all the time. Roy the Fairview recording engineer thought we were all stoned on drugs but we weren't, we were just 5 lads enjoying the experience. After the recording session we started our mini-tour of the working men's clubs of York. I kept hearing that this guy was coming from this record company to this gig or that important manager was coming to that gig. The only person I ever saw was a guy in a suit turned up in the dressing room after one of the concerts. Apparently from some important Leeds based management company. He was hanging around saying how great the band was, when he turned to me and said " Who are you?". Garry said to him " oh! that's Ian our new keyboard player". The suit then turned back to me and said " you're lucky then to join this band just as their making it big". I said "no not really their lucky to have me"
As the mini tour continued I was becoming increasing unhappy with my situation and role in the band. Garry had told me that there was a split in the group as to whether keyboards were necessary with Garry & Goeff (the drummer) wanting keys while John (guitar) & Gary (bass) whated to remain a 4 piece. When the band played live I was only allowed to play on the 5 songs I played on the album plus a couple of Beatles covers. This was very unsatisfactory and when I discussed it with Garry he said that I would be included in the new material he was writing. I was also hidden behind the P.A. system at every gig so that most of the audience couldn't see me. I had always been a very visual performer who enjoyed dancing around when not playing my instrument. I was not surprised when Garry told me of the bands decision not to keep me after the mini-tour finished, on the last night we had a party after the gig and went our separate ways. All in all I was with the band about 6 months. It was not the last time I would play with these guys, the two Garry's and Geoff and I got together with other musicians and started a soul band (later to morph into the Goose Horns) although I left after a few rehearsals because of my Art of Vision commitments. 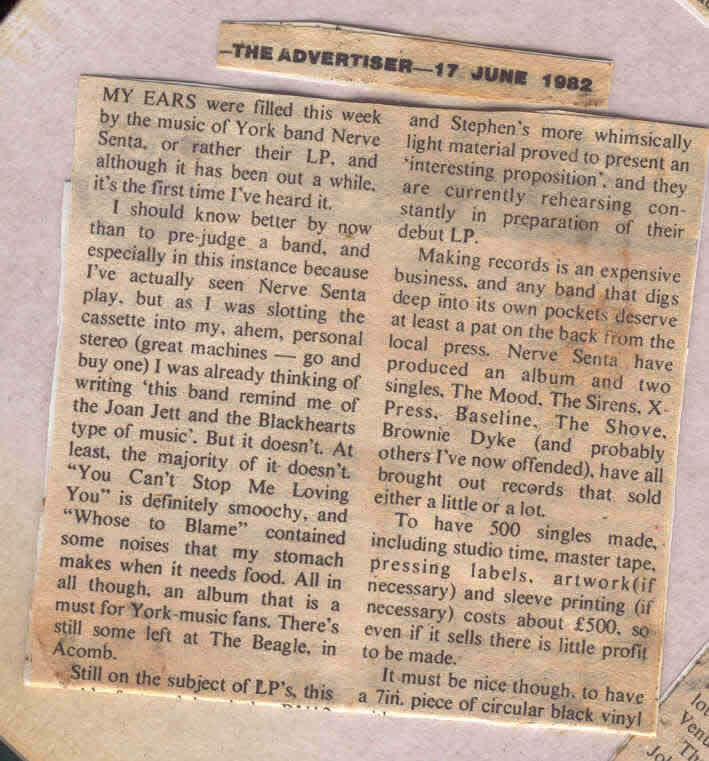 At the end of 2009 Garry contacted me out of the blue saying that Nerve Senta were re-forming for one night in May 2010 and was I interested in playing the album again. I of course said yes, so we started weekly Saturday afternoon practices at a farm on the outskirts of Strensall. It was great to be back making music with Nerve Senta. We rehearsed for a few month and had a fantastic reunion gig. On the back of the reunion gig Garry & Geoff asked me if I would like to join their Beatles tribute band The Pepperhearts. I thought it might be fun and I'd worked with Dave Powell (guitarist) before in Airport and like him a lot. So I duly learnt the required songs and settled into a couple of practices everything was going well and I was getting ready to join the band. All of a sudden I got a text from Garry telling me that the band was split about having keyboards and I wouldn't be joining them, apparently Dave & Paul (John Lennon) didn't want to split the money five ways. Suddenly we're back to 1982 and Nerve Senta's indecision over keyboards.